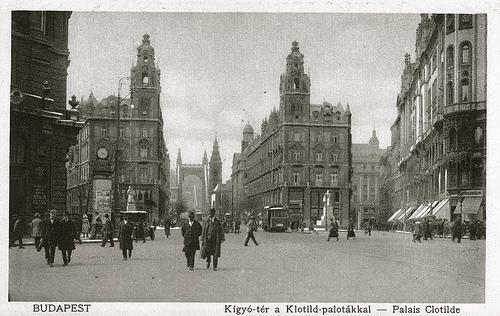 The Klotild Palace is one of the typical Hungarian Neo-Baroque eclectic twin buildings constructed during the turn of the 20th century to designs by Kálmán Giergl and Flóris Korb. The Klotild Palace is one of the typical Hungarian Neo-Baroque eclectic twin buildings constructed during the turn of the 20th century to designs by Kálmán Giergl and Flóris Korb. From the Rákóczi Road, the Klotild and Matild look like the gate to Elisabeth Bridge on the Danube. The steel building is clad in stone, and is topped by a replica of a crown. Fitted with the first elevator in Budapest, and glass windows by Miksa Roth, it stands as a symbol of luxury. It is currently the Buddha-Bar Hotel.